This is one of a set of three stacking chairs said to have been used in the "Isobar", part of the Lawn Road Flats. These flats, commissioned by Jack Pritchard and designed by Wells Coates, were the first modernist buildings in London. Marcel Breuer (1902-1981) studied and worked at the Bauhaus in Germany. When he emigrated to England, in addition to private commissions he designed furniture for the manufacturer, Isokon. 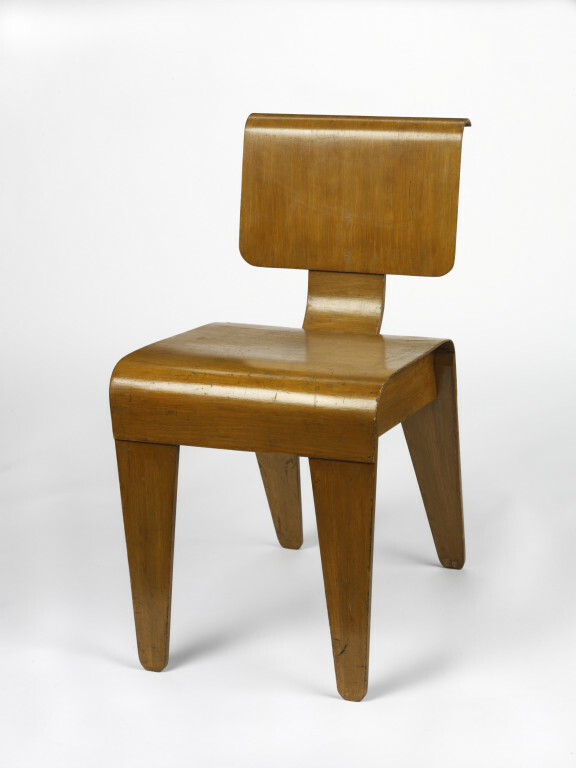 The use of moulded plywood for these chairs reflects British Modernism, which favoured the soft curves and warm appearance of wood rather than the harsher aesthetic of metal furniture. Exceptionally thin and light birch plywood chair. 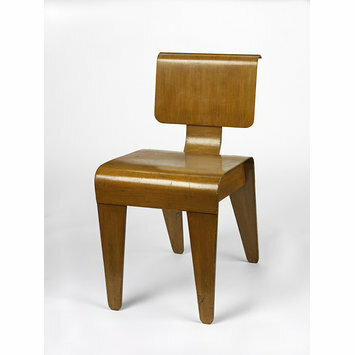 Front and back legs are made of one panel of six ply plywood forming an upside down u-shape. The legs are tapered on both sides with rounded ends. The front and back leg sections panel are connected by a rectangular side panel that is set into a recess carved into the inner surfaces of each leg section. The panel is shaped to support the front legs as straight and the back legs as raked. The top of the panel sits with its rounded edges flush under the seat. A large part of the length of its top is cut in a shallow recess, holding in place at back and front a small rail the end of which runs under the front and the back of the seat for its support. The seat is of thin plywood, wrapped around these side panels and glued on to the front and back leg panels. The back is a similar thin panel with rounded corners, straight at the bottom and bent over in a generous curve at the top. The back is glued to a wide strut of six ply plywood, the top end of which runs approximately half way up behind the back. The lower edge of the strut is gently bent forwards from below the back to fit through a slit in the curve of the back of the seat, from where it is bent back again and glued to the inner edge of seat continuing to its lower edge. In addition to the glue connection, this middle (spine) panel is secured with three metal screws of the bottom. These chairs were used in the Isobar at Lawn Road Flats, Hampstead, NW3. This set of three stacking chairs is said to have been used in the "Isobar", part of the Lawn Road Flats, one of the first modernist buildings in London, commissioned by Jack Pritchard and designed by Wells Coates.